If you were about to eat something, you may want to put it down for just a second. Now pick it up and take a closer look at it: Any dead animals that shouldn’t be there? No? You’re luckier than two people in Florida who found a dead bat in the packaged salad they were in the process of consuming. Fresh Express is recalling a salad mix sold at Walmart stores in the Southeastern U.S. after a report of “extraneous animal matter” that was allegedly found in a single container of the salad, some of which they’d already eaten when they found the bat. “Out of an abundance of caution, all salads manufactured in the same production run are being recalled,” says the Food & Drug Administration. The item subject to the recall is 5 oz. 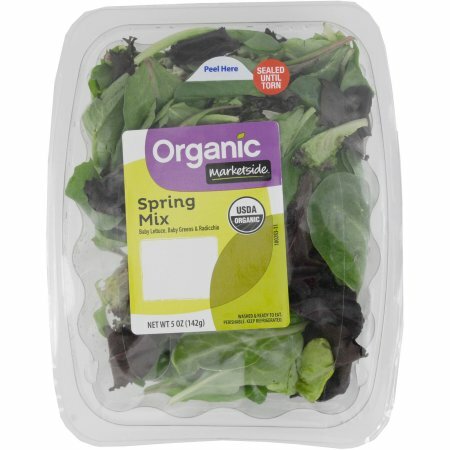 Organic Marketside Spring Mix which comes in a clear container with production code G089B19 and best-if-used-by date of APR 14, 2017 located on the front label. Look for UPC code 6 8113132897 5 located on the bottom of the container. The product was only sold at Walmart stores in the southeast. Experts from the Centers for Disease Control and Prevention are also helping the Florida Department of Health and the FDA to investigate the dead bat situation. The CDC adds that it’s extremely uncommon to get rabies by eating a rabid animal, and that the virus doesn’t live long outside infected animals, so there’s some good news. Although the risk of rabies transmission is very low in this situation, the CDC says it recommended the two people who ate the salad from the bat’s package begin post-exposure rabies treatment. Walmart acted quickly to remove the product from shelves, but anyone who’s already purchased the recalled product should discard and not consume it. You can get a full refund at the place of purchase or by calling the Fresh Express Consumer Response Center toll-free at (800) 242-5472 during the hours of 8 a.m. to 7 p.m. Eastern Time.